The Logo appears at the top left corner of the campaign, and this is typically used for the logo of the organization. This is also what appears as the header for your automated receipts sent to your supporters. The Campaign Thumbnail appears on the campaign card and also serves as the default image when someone shares the campaign on social media. (Although you can adjust the social media settings separately of the thumbnail after you create the campaign). Unlike the logo for your organization, this is typically an image that is descriptive of the campaign itself. 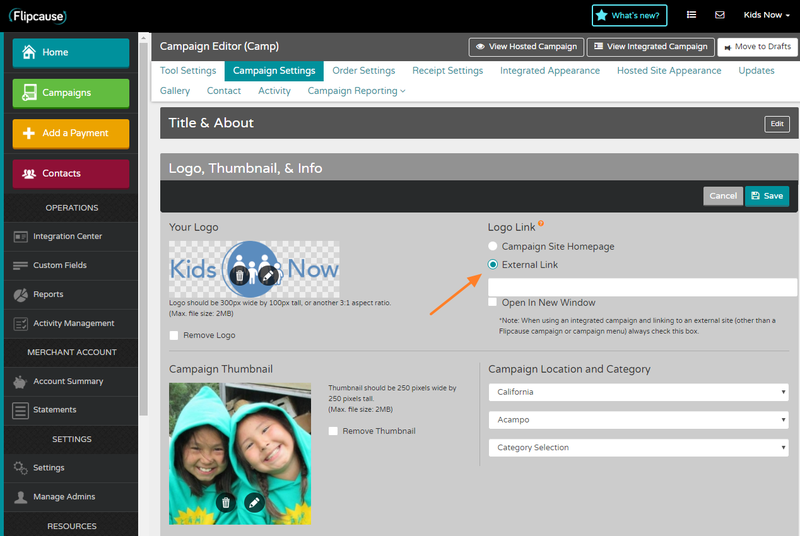 The Logo Link allows you to choose where to direct your supporters when they click your logo on a campaign. By default, the logo leads to the Campaign Site Homepage. Each campaign will auto populate the Logo and Campaign Thumbnail based on what is set in the Campaign Presets area. Under “Your Logo”, click on the box and choose the file you would like for your logo or drag and drop your desired image into the box. If there is already an image displaying that you would like to change, click on the trash can to remove the current image, then follow the aforementioned steps. The ideal aspect ratio for the height x length of the logo should be 1x3, and at least 100 pixels by 300 pixels in resolution. Logos can be uploaded of any size or aspect ratio, just keep in mind they will automatically be resized to be 100 pixels tall (so uploading a square logo might render the image too small). Notice how the Kids Now logo is horizontally aligned, allowing it to serve as a good email header image for the receipts. Click the trash can to remove the current image and click the box and choose the file you would like for your logo. The thumbnail will have to be square, and a minimum resolution of 200 by 200 pixels. Regardless of what aspect ratio your image is which you would like to upload, a cropper will appear and you can select which square section to use for your campaign thumbnail. In order to access the cropper, click the pencil on the thumbnail to adjust what appears in the square section. Make sure to hit Save once finished!